A new Cornell University-led study shows that Midwest agriculture is increasingly vulnerable to climate change because of the region's reliance on growing rain-fed crops. Ariel Ortiz-Bobea, assistant professor of applied economics and management, set out to assess the impact extreme weather is having on agricultural productivity in the United States. While previous studies have looked at the vulnerability of individual field crops, which make up one-third of the country's agricultural output, researchers haven't addressed the whole scope of agricultural production, including livestock, at the national level. "We're trying to get a big picture idea of what is going on," said Ortiz-Bobea. "The data captures every state's agriculture over the past 50 years. If you see in the aggregate data that something big is happening, this really captures massive processes that are affecting many people at the same time." The resulting paper, "Growing Climatic Sensitivity of U.S. Agriculture Linked to Technological Change and Regional Specialization" published in Science Advances, pinpoints the specific regions in the U.S. that are growing more sensitive to extreme climate shocks. 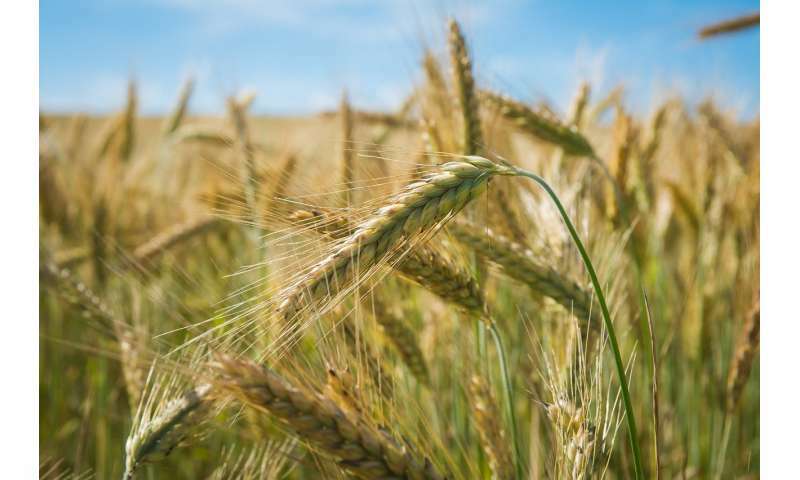 The area of greatest concern is the Midwest, where rain-fed field crops like corn and soybeans have become increasingly vulnerable to warmer summers. To get this panoramic snapshot, Ortiz-Bobea and his team used state-level measures of agricultural productivity that capture how inputs—such as seeds, feed, fertilizer, equipment and herbicides—are converted into economic outputs. The researchers mapped that information against nearly 50 years' worth of climate data from 1960 through 2004, essentially seeing what would happen if weather was treated as an additional input. The results show a clear escalation in climate sensitivity in the Midwest between two distinct time periods. In the 1960s and '70s, a 2-degree Celsius rise in temperature during the summer resulted in an 11 percent drop in productivity. After the 1983, however, the same rise in temperature caused productivity to drop 29 percent. While these damaging summer conditions usually only occur six percent of the time, the researchers indicate that an additional 1-degree Celsius warming would more than quadruple their frequency to roughly one of every four years. "Losing almost half your profit every four years? That's a big loss," said Ortiz-Bobea, a fellow at Cornell's Atkinson Center for a Sustainable Future. One of the reasons the Midwest is growing more vulnerable to drastic climate variations is because its agriculture industry is increasingly specialized in crop production, like nonirrigated cereal and oilseed crops. "Specialization in crop production is a compounding factor," said Ortiz-Bobea, who collaborated on the paper with Erwin Knippenberg, a Cornell doctoral student in applied economics and management, and Robert G. Chambers of the University of Maryland. "Most of the agriculture in the Midwest is corn and soybeans. And that's even more true today than it was 40 years ago," Ortiz-Bobea said. "That has implications for the resilience to climate of that region, because they're basically putting all their eggs in one basket, and that basket is getting more sensitive." They should have gone back to the 1920s - 1930s when Oklahoma, Kansas and Nebraska turned into a dustbowl and forced the Okies to sell their lands and move to California. So, are they saying that Oklahoma will become a dustbowl again? Well, climate change does not exist and it is a scam invented by the Chinese climate scientists to somehow scam the American Trump voter... so why bother? Time they got a taste of their own medicine. I'm not sorry at all. Oh enri, I thought segue was the class idiot. But you have knocked him off his corner stool & stolen his dunce cap! Perhaps you might reconsider the ridiculous contradiction of your comment? If Climate Change is non-existent & a fraud? How could you blame the Chinese for events you deny? The segue is such a low bar. Crawling under him for expressing your politically correct, ideological cant? Just makes you both look perverted.